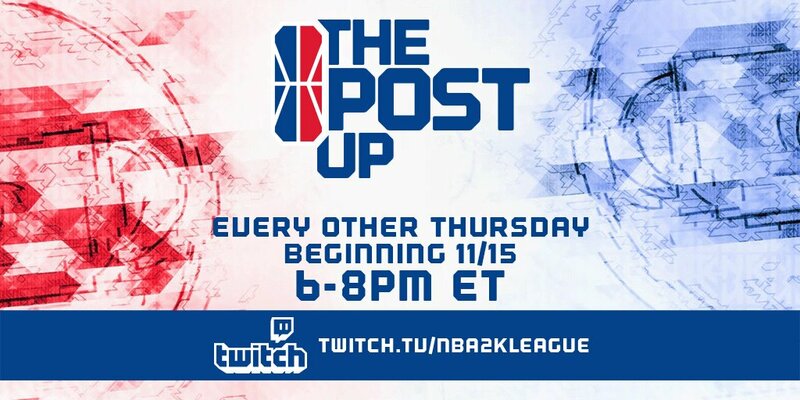 The NBA 2K League debuted its new show, The Post Up, live on Twitch from 6-8pm EST (twitch.tv/nba2kleague). I wanted to review the league’s first major media step in the offseason, notwithstanding the NBA 2K League expansion draft. The show topped out at around 1,300 concurrent viewers on Twitch, with 2,137 unique viewers (per Twitch Tracker). That’ll have to go up, in the pattern of the NBA 2K League viewership numbers, but it’s not at all a poor start for the show’s first week, especially in the offseason. The denouement came early on, with League MD Brendan Donohue announcing the season-two combine info. The more face time he gets on the show, the better. I also wouldn’t mind if a bi-weekly appearance for Donohue on The Post Up became the venue for his occasional State of the NBA 2K League addresses, rather than arbitrary educational appearances on periscope. Several major names from the league and the community made appearances on the show. NetsGC advisor OGKINGCURT made a video appearance from Ohio; star Knicks Gaming point guard iamadamthe1st face-timed in from his ride to the show (he was supposed to make it live, but heavy snow in NYC put a stop to that—he’ll be back); Forbes contributor Brian Mazique also made a video appearance; and FirstShake co-hosts BlkFrankWhite and CompBayless made it to set live. Curt spoke well as usual; that slot, I expect, is likely to be a revolving door for front office personnel to make an appearance, as it should be. Adam is arguably the league’s best player-ambassador, and living near New York he should and will have the opportunity to return plenty of times. The anecdote about his brother was just too goshdarn cute. Things will be better when he’s on-set and gaming; we’ll give it a pass for the weather. Other players will certainly make their appearances, especially those from New York who are around in the offseason, but once the league starts up they’ll have their pick of players who are in town Thursday nights before the regular season weekend. Mazique also provided some nice insight, touching on several top prospects including PeteBeBallin, ExposeHim, and TimmiTHD. One wonders, however, why the league didn’t bring on Scott Cole or Dirk (the latter certainly free to face-time in), the commentary team from season one. Dirk in particular is especially beloved by the community and, as color commentator, is someone the league trusts to offer analysis. Hopefully he and Scott will make their appearances at some point soon. The ever-popular FirstShake duo appeared live on set, disputing and disagreeing about NBA 2K League topics in their usual fashion. They’re always entertaining, but I think more so on their own weekly show, which offers a less constraining and time-limited atmosphere for their lengthy debates. The interruptions fit well in the context of a larger argument, but once that’s shoehorned into a smaller window and engaged by multiple other voices, the authenticity of the Frank/Comp duo is slightly diminished (still very much on the surface and unencroachable, though). It’s best for the league if FirstShake isn’t transposed into The Post Up. It’s at least workable should Frank and Comp be full-time fixtures: one single question or list, delved into in more depth, will be better for the flow of the show on the whole. I liked the segments interspersed with highlights and season narratives on “Action Time.” While a little disjointed, the highlight section is a really good way to inform first-time viewers about the key storylines from season two. Hopefully they’ll develop those storylines on Action Time segments in the future (team protected player highlights) or focus on specific teams or events from season one. Hosts Jeff Eisenband and Erin Ashley Simon did a nice job in the first episode. They’ll improve their chemistry as they get more experience with the show and will figure out a better ratio between their own comments and checking the Twitch chat, which isn’t the end-all be-all of an event on Twitch. Also, they’ll figure out their best cues and will make the times when it’s just the two of them on-screen better. The audio/visuals will tighten up—just get rid of those atrocious pans to the snow falling outside with people talking loudly overhead—but the quality and graphics are clean-cut and sharp to begin with. Overall, a solid start. More consistency and proper placement of guests, a little more chemistry live on set, and some tightening-up of the production as a whole, and The Post Up will go from average on the low block to Ramo in the post.